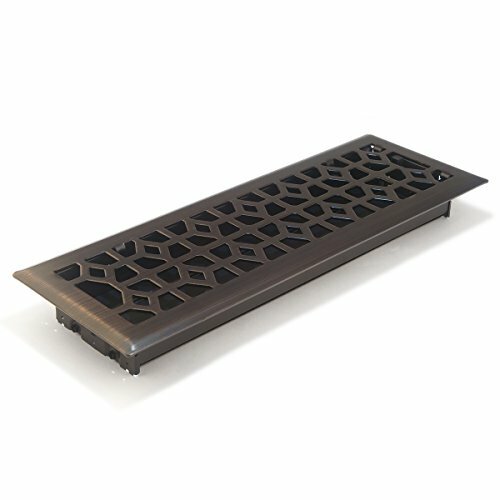 Accord AMFRRBM414 Marquis Floor Register, 4-Inch x 14-Inch(Duct Opening Measurements), Dark Oil-Rubbed Bronze by Accord Ventilation at Verso Laquila. MPN: AMFRRBM414. Hurry! Limited time offer. Offer valid only while supplies last. Accord Ventilation model AMFRRBM414 is a Dark Oil-Rubbed Bronze, 4-Inch x 14-Inch(Duct Opening Measurements), Floor Register with a Marquis Design. Accord Ventilation model AMFRRBM414 is a Dark Oil-Rubbed Bronze, 4-Inch x 14-Inch(Duct Opening Measurements), Floor Register with a Marquis Design. To determine the correct size to order, measure the size of the duct opening (not the old vent itself). Each Accord Ventilation product is crafted using high quality materials that provide strength and durability. Accord Ventilation produces floor registers, grates, and vents in a variety of designs and sizes. Accord Ventilation products are sure to enhance any home decor. Our Lifetime Limited Warranty covers every floor register, vent, grate, and grille manufactured by Accord Ventilation. View More In Registers, Grilles & Vents. If you have any questions about this product by Accord Ventilation, contact us by completing and submitting the form below. If you are looking for a specif part number, please include it with your message.